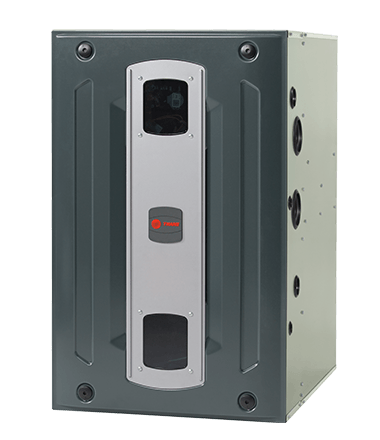 Today's new high efficiency furnaces can save up to 50% in operating costs over a ten-year-old furnace. Many 1990 and earlier model furnaces have Annual Fuel Utilization Efficiency (AFUE) ratings of 65% or less. The minimum AFUE rated furnace that can be sold in the United States today is 80%. Our current product offering starts at 80% AFUE and goes all the way to a very efficient 96.6% AFUE rating. Depending on your average usage, higher AFUE rated furnaces can significantly reduce your gas bill. We offer many furnaces with variable and multi-speed features that can provide enhanced indoor comfort by slowly ramping up to your thermostat setting rather than simply turning on at full speed. This alleviates the "cold air blow" often associated with single speed furnaces, and dramatically reduces system noise. Factory Warranty Parts: 10-year limited warranty on internal functional parts. Heat Exchanger Warranty: Lifetime Limited Warranty on heat exchanger.